Finally! It’s warm enough and dry enough to enjoy the first fire pit of the spring! Time to listen to Derek and the Dominos’ Key to the Highway, smoke a big cigar, drink an adult beverage, check the scores on the CBJ game, and hope that spring is here to stay. The National Hockey League playoffs are underway. The Columbus Blue Jackets had an up-and-down season and were one of the last teams to clinch a playoff spot. Their reward was to draw the mighty Tampa Bay Lightning in the first round. The Lightning had a record-setting season that saw them lose only 16 games, and in their playoff match-up with the CBJ they are prohibitive favorites. Playing at home in the first game of the playoff series last night, the Lightning jumped out to a 3-0 first period lead, making the prognostications of a four-game sweep look solid. But somehow, goalie Sergei Bobrovsky made some improbable saves, the Blue Jackets kept their poise and started chipping away at the lead, and thanks to a three-goal third period and a last-minute power play score the CBJ — improbably — pulled out a victory on the road. One road victory does not a series win make — as the Jackets learned last year, even two road wins doesn’t do that — but last night’s win allows CBJ fans to dream of an upset and has to give the team a shot of confidence. Speaking for the city of Columbus, it would be nice to see the Blue Jackets, who have never won a playoff series in their history, advance to the second round. For now, though, we’ll just settle for the general aura of good feeling that descends upon a town when its team gets a big win. I expect there will be a lot of happy faces around downtown Columbus today. Well, the NCAA Tournament is over, and your annual foray into gambling with your officemates has ended — in abject failure, as usual. You’re feeling a bit wistful about it. In fact, you acknowledge, you don’t really care all that much about the money element of the office pool — it’s the social interaction, and the trash talking, and the possibility of getting bragging rights, that’s the real attraction. It’s been fun following your brackets and talking to your friends about how you’re doing, and you’ll miss that. So how about scratching that itch by getting together with your friends and combining the concepts of office NCAA pool, fantasy sports league, and everyone’s favorite big-budget quasi-medieval/sword-and-sorcery/dungeons-and-dragons HBO show? Except, unlike the NCAA pool where you’re trying to pick winners of basketball games, in this pool you’re trying to select the characters who are most likely to get killed and earn your team valuable points. Ladies and gentlemen, allow me to introduce you to the Game of Thrones Death Pool. It’s straightforward. Identify fellow rabid fans of the show, figure out how many of your pals will be in the pool, and set a time for your draft. Come up with a list of characters (there’s a lot of them, by the way). Figure out what you’re going to kick into the kitty and how you’re going to allocate the money — whether it’s after each episode, or at the end of the season, or both. Decide how many rounds the draft will go. Prepare a grid that people can use to keep track of who’s drafted whom, and appoint a commissioner — being a Game of Thrones pool, perhaps Archmaester or High Septon is a better title — who will keep track of the scoring, provide a brief recap, and let players draft from the list of remaining (and new) characters to replenish their roster and replace the characters who’ve been killed. And then get together with your friends, have your draft, and enjoy an adult beverage or three while you’re deciding whether Brienne of Tarth is more likely to get knocked off early in the season than, say, Varys or The Mountain. There’s some strategy and skill involved, because even if you’re reasonably sure that a character is going to get rubbed out at some point — like, for example, Cersei — if you think they’ll last through the first few episodes you might want to hold off on drafting them in favor of a more minor character that could easily meet their maker in an earlier episode. We had our Game of Thrones Death Pool draft last night, and it was a lot of fun. We each are kicking in $45, points and money will be allocated after each episode and at the end of the season, and the ultimate winner will get an authentic knock-off Hand of the King pin purchased from Amazon. There were five of us, and we had five rounds in the draft. I drafted second and am pretty happy with my team, which consists of Melisandre, Qyburn, Baric Dondarrion, Yohn Royce, and Gilly. Let the GOT Death Pool begin! At any given moment, there’s always a hot restaurant in town. It’s the place that has gotten some favorable press, that has a certain distinctive buzz about it, that everyone is itching to try. In Columbus, the restaurants don’t come any hotter than Service Bar, which has been getting great press — including a recent rave from no less than the New York Times. Last week, Kish and I decided to check it out. Service Bar is part of Middle West Spirits, located just off Fifth Avenue in the zone between the northern part of the Short North and the southern edge of the Ohio State campus area. It’s in a bright, fresh space, with room for a row of tables, a long common table, a private dining room, and a bar. The wait staff is terrific — friendly, professional, and knowledgeable. 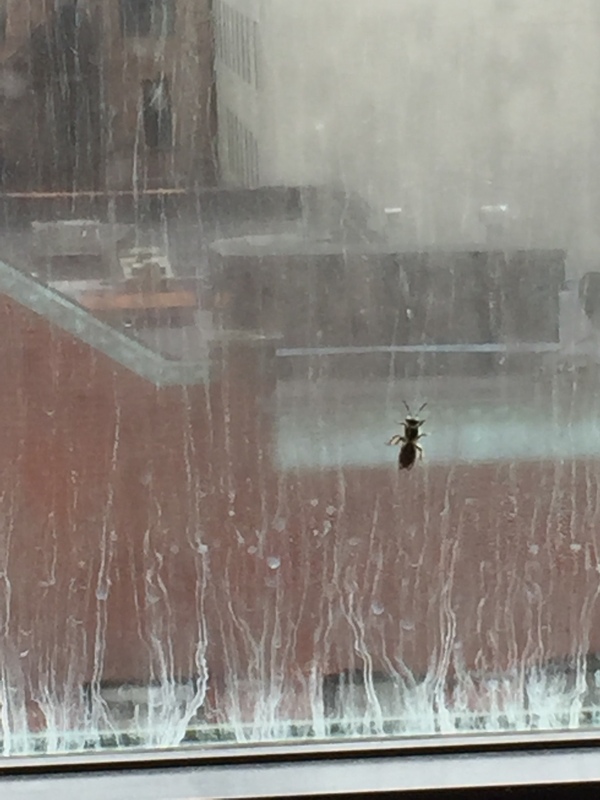 A fine wait staff is a pretty strong sign of fine dining to come. 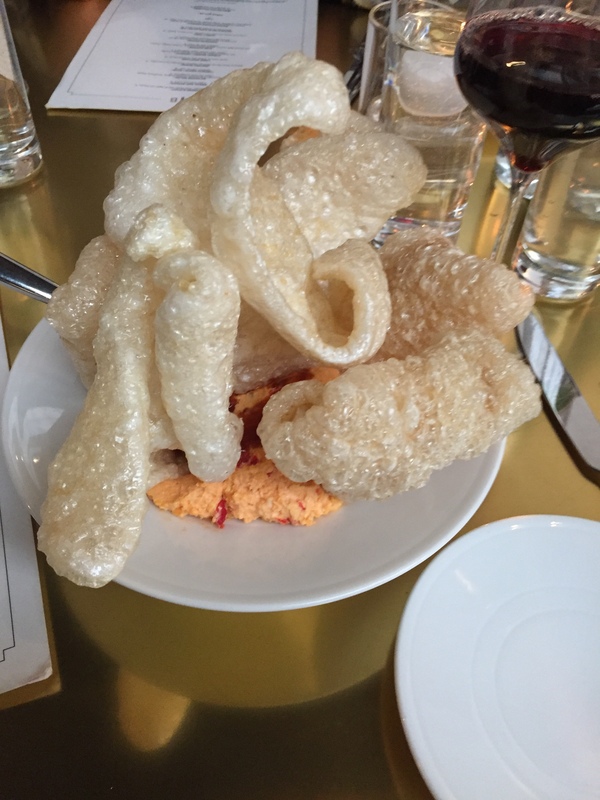 When we were deciding on an appetizer, we looked down at the row of tables where we were sitting and every one — without exception — had ordered the “cheesy poofs.” These are a mound of colossal pork rinds served with pimento cheese spread that you slather on. Our waiter said they seem to be a favorite for patrons, so we gave them a try. They were greasy and cheesy and good, but the order was just too much food for the two of us, and we wanted to save room for our entrees. We both ordered the Mongolian glazed short rib for our entree, and here the meal really hit its stride. The short rib was meaty and luscious, topped with an interesting assortment of mini cucumber slices and other items, and surrounded by dollops of a delectable sauce. The challenge was to carefully assemble each forkful to feature meat, the different flavors and textures of the toppings, and a healthy dousing of the sauce, and when you successfully met the challenge the taste combination was incredible. But to take the whole dish a step further, the meat was accompanied by three “bao knots” — moist, doughy, chewy morsels of bready delight that were a perfect complement to the meat. I think I could probably eat a thousand bao knots and never think of the words “low carb” again. After a main course like that, we had to get dessert, and went for the carrot cake with our after-dinner cup of decaf. The cake was light and delectable, served with a schmeer of meringue, some crunchy items, and a delicately flavored ice cream. It ended the meal with a bang, and was the kind of dessert where you find yourself surreptitiously scraping the plate multiple times just to get a final taste before you reluctantly allow your server to take it away. Service Bar lived up to the hype, and then some.